Elmridge Golf Course of Pawcatuck, Connecticut (CT) welcomes your group outing, golf tournament, or fund raising event. Our 27 hole layout can accommodate up to 216 golfers, making us the ideal venue for those special events that fill up every year and have to turn away players. The Clubhouse at Elmridge Golf Course can provide everything from formal banquets to box lunches, ensuring that your event will be a success, both on the golf course and in the clubhouse. 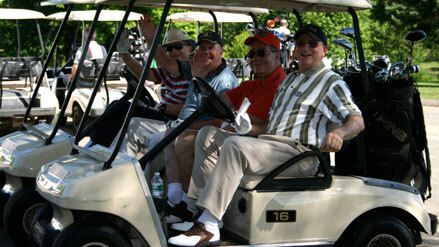 Call (860) 599-2248 to book your golf outing. - There is a thirty-six player minimum to qualify for our outing rates. ( Events with less than 36 players are welcome at our regular published rates). - Our 27 hole layout can accommodate events up to 216 players. renting additional carts for the day.